Welcome to the Colorado State Bookstore. We're glad you stopped by and we hope that you find exactly what you're looking for. Shopping categories include books about Colorado people, books about Colorado History, Colorado Cookbooks, Hiking and enjoying the Colorado outdoors, Colorado reference books, and calendars, magazines and newspapers, DVD and videos, and posters under MORE. In The Colorado State Bookstore you will find information about Colorado for readers of all ages. Age ranges for books for young readers are highlighted in red. Have fun. The images of early west photographer William Henry Jackson captured a Colorado landscape both pristine and already affected by the onslaught of western civilization. 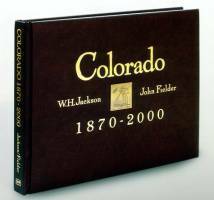 Standing exactly where Jackson stood, and pointing his own camera in precisely the same direction, John Fielder has re-photographed Jackson's Colorado and captured the often startling changes that have occurred over the last 100 years. Breathtaking and stark, hopeful and disquieting these photographs are accompanied by the thoughtful essays of Roderick Nash, Ed Marston and Eric Paddock.